I have a lot of yarn already this week since the launch of the Tour de Fleece on Saturday. 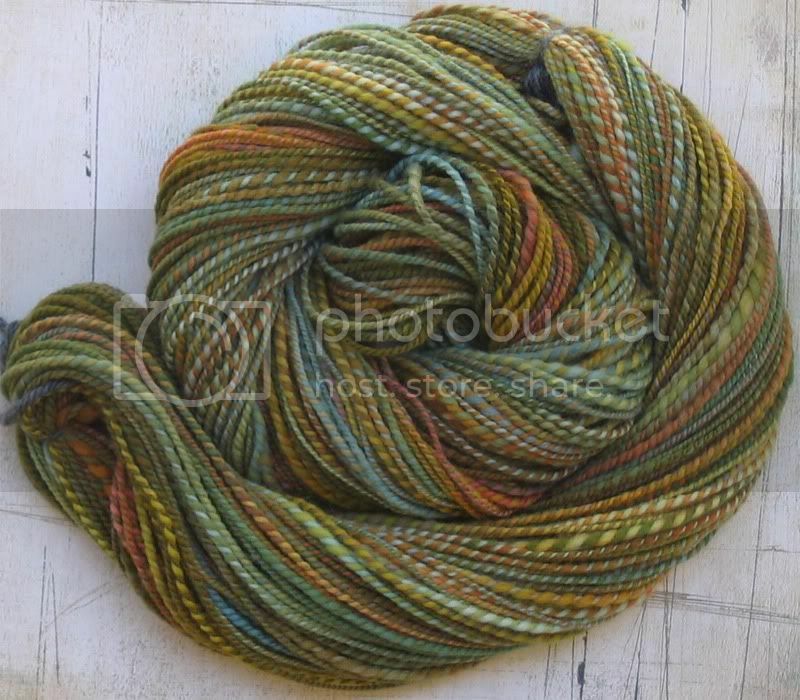 Three of the four of these yarns were spun from the same hand-dyed roving I bought at the Black Sheep Gathering. The stuff dyed by Ronnie's handspun's nine year old grandson. I decided to try spinning it in different ways as an experiment. A sport weight, a worsted to bulky, a boucle and a single. You'll have to wait to see the single by the way. It's currently drying in my shower! First one here is called "Canterbury" since that was the stage of the Tour de France I watching while spinning. It's that very roving, spun into a single a plied with steel colored thread. I admit it makes me happy. I'm experiencing a love affair with these colors. Number three down is vegetable patch. Yes, the same roving spun into a 2-ply worsted to bulky weight yarn. I like how the colors didn't blend as much in this one compared to the one above. Would you believe it's all the same roving? The last one here is called spring cleaning. 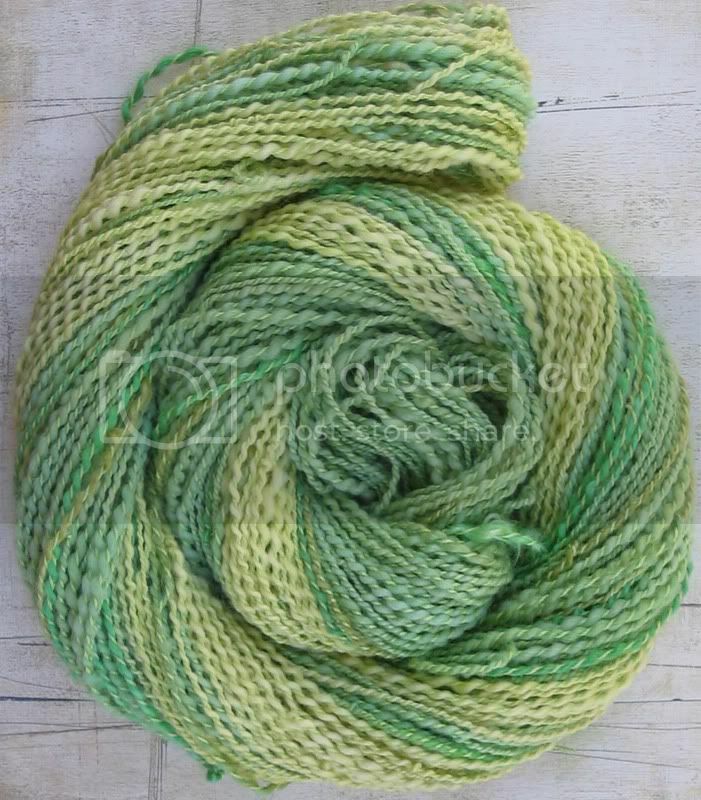 It's a lemon-lime boucle style yarn with a great deal of bounce. 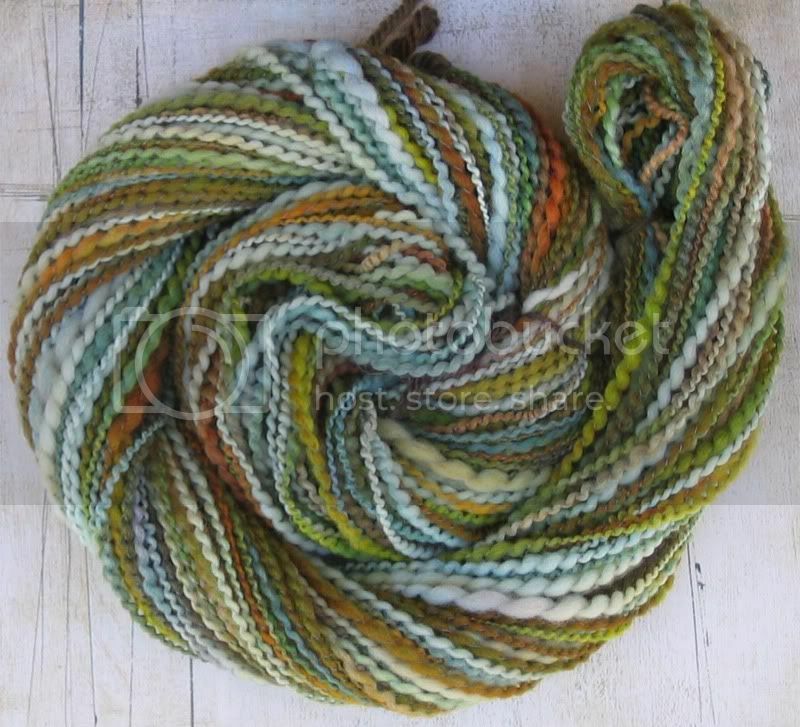 It's hand-dyed mill ends and mohair locks spun up and plied with wasabi crochet thread. I'm so happy the Tour has forced me to spin every day. I'm hitting my goal of eight skeins a week! Well that's a skein a day plus a bonus one for enthusiasm... or challenge. Either way. I'm happy to report that after one week, our Tour de Fleece spinners are rocking the wheels. In case you forgot, check out the Flickr pool, full of very lovely yarns. Today is the last flat stage in le Tour for a while. The cyclists hit the mountains this weekend so in solidarity I better kick it up a bit. Of course, this is when it starts to get really interesting! 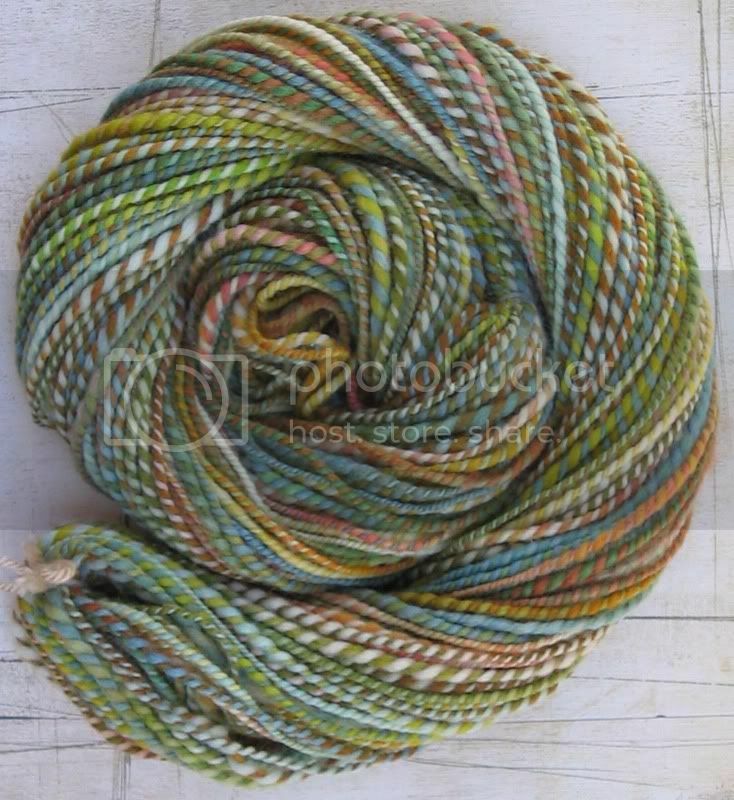 That's amazing that those top three yarns came from the same roving! 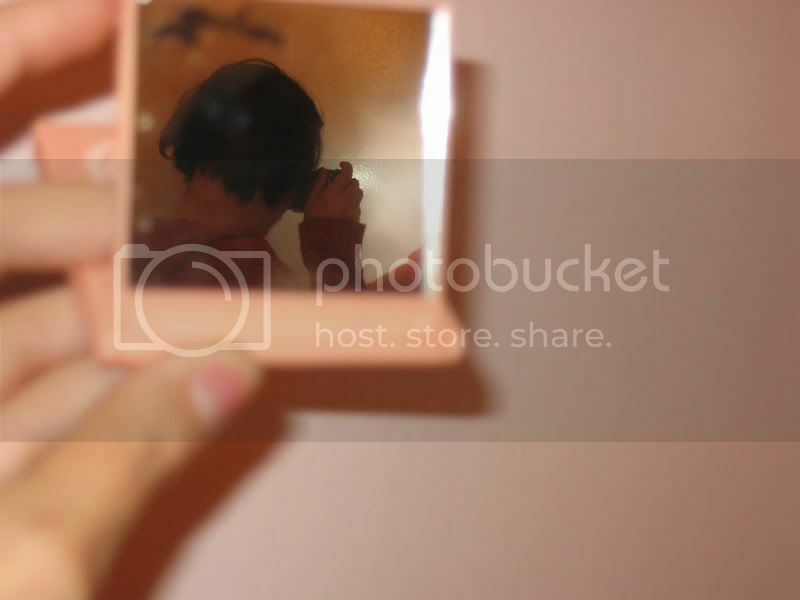 Each one of them is beautiful, but I love the second one the most. I hope the judging goes well. Good luck! those yarns look fabulous! woo hoo! lovely yarns there, I'm impressed. And what progress, you're certainly up there with the race leaders. I'm bimbling along happily in the peleton, but enjoying the ride. Can you tell me how to join the Flickr pool, can't seem to work it out. I signed up for the Tour on your blog and I have a Flickr account.